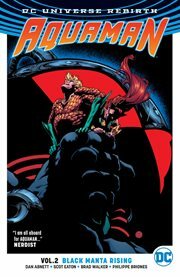 The item Aquaman, Volume 2, issue 7-15, Black Manta rising, Dan Abnett, writer ; Scot Eaton, Brad Walker, Philippe Briones, pencillers ; Wayne Faucher, Andrew Hennessy, Daniel Henriques, Philippe Briones, inkers ; Gabe Eltaeb, colorist ; Pat Brosseau, letterer ; Brad Walker, Andrew Hennessy and Gabe Eltaeb, collection cover artists, (electronic resource) represents a specific, individual, material embodiment of a distinct intellectual or artistic creation found in Lawrence Public Library. He is Arthur, King of Atlantis, Lord of the Oceans, founder of the Justice League. He is one of the greatest heroes the world has ever known. He is Aquaman... ...and one man is about to tear his world apart. With a heart of darkness as unfathomable as the sea itself, the ruthless masked terrorist known as Black Manta has dedicated his life to Aquaman's demise. Now he's about to set his grand plan of vengeance in motion. He will unleash an unstoppable behemoth to destroy all that lives beneath the surface-and above it. He will command an underwater army to set off a depth charge of conflict and carnage. He will pit the world's two most powerful nations, Atlantis and America, against each other in a war to the death. Black Manta is rising. And soon Aquaman, Atlantis and the entire world will fall... The stunning climax of a legendary rivalry decades in the making, AQUAMAN VOL. 2: BLACK MANTA RISING is a must-read chapter in the undersea saga from the creative team led by writer Dan Abnett (TITANS) and artists Scot Eaton (BATMAN & ROBIN ETERNAL), Brad Walker (ACTION COMICS) and Philippe Briones (NEW SUICIDE SQUAD)-exploding from the pages of the ground-breaking DC Universe Rebirth event!